What does sEMG stand for? sEMG stands for Surface Electromyography. SEMG is a device that measures the amount of electrical activity your muscles release when they are contracting, more commonly known as muscle tension. It is similar in function to an EKG that measures heart muscle activity. Not at all. IT is totally non-invasive and does not cause pain or irritation. This makes it totally safe for infants, children, pregnant women or seniors. It simply requires the placement of small probes against the skin, with the test taking less than a few minutes. Why is muscle activity important? Muscles have a tendency to “brace” in response to spinal misalignments known as Vertebral Subluxations. These Subluxations create nerve interference which affect muscles, blood vessels and internal organs. Dr. DiRubba scans a patient with sEMG. Colors indicate levels of tension: average are green, pink are moderately high, and red are high levels of tension. Yellow readings indicate abnormally low, or fatigued muscles. Arrows indicate an imbalance. Vertebral Subluxations reduce your body’s ability to maintain optimal health. When Vertebral Subluxations are present, the nervous system is negatively affected resulting in increases or decreases in muscle activity. 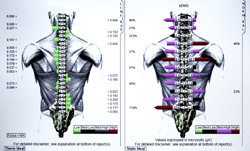 The sEMG shows the muscular component of the Vertebral Subluxation Complex. The Chiropractor’s job is to detect and correct these vertebral Subluxations by a simple and effective procedure called an “adjustment”. How do chiropractic adjustments affect my sEMG? The Chiropractic Adjustment has many positive benefits to your nervous system. In most cases, the sEMG normalizes and balances. Why do chiropractors use computerized spinal examination? 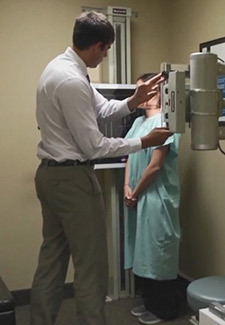 Digital X-ray located on site. At a modern Chiropractic Office, your Doctor is committed to using the highest quality research and clinical grade instrumentation available for the purpose of detecting and correcting the Vertebral Subluxation. The difference in blood flow creates difference in temperature as displayed by color bars. The further the bar extends, the greater the injury, spinal dysfunction or subluxation. SEMG and Thermography data help you chiropractor determine the type of care best suited to your needs. Your chiropractic progress will be evaluated with follow up testing.